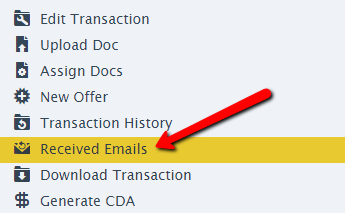 Master admin can delete received emails and their corresponding notes from transactions. Click [Received Emails] from the left menu. Click on the email you would like to delete. The email will expand allowing you to review the body. Click the [X] at the bottom of the email to delete. Hover over the note to be deleted and click the [X] that appears to the right of the note. Received emails are part of a transaction's audit trail. We recommend that you only delete an email if it was sent in error.